When I was previewing MAC Cosmetics Fall/Winter collections last month, the one that really stood out to me was The Simpsons Collection. In honour of The Simpsons 25th anniversary (I can't believe it's been that long), this limited edition collection is currently in stores and centres around who else but the ever fashionable Marge Simpson? It should also come as no surprise to you that I was most interested in trying out Marge Simpson's Cutie-cles ($16.50 USD/$19 CAD). 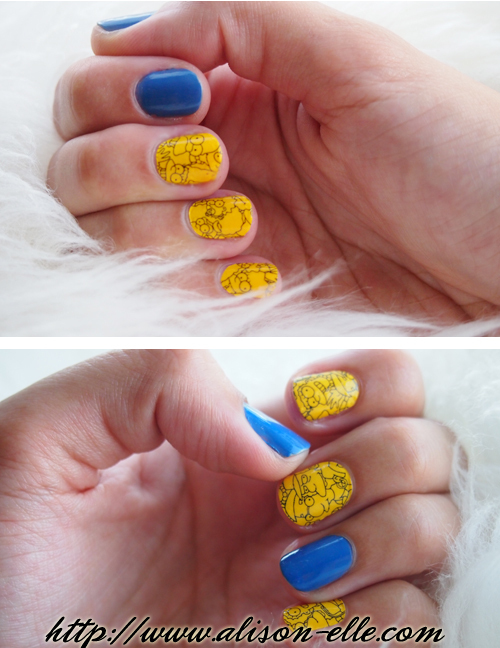 With a bright yellow background, these nail stickers feature many of our favourite faces, from Homer, Marge, Bart, Lisa, and Maggie to secondary characters like Moe and Milhouse. To achieve this fun mani, I decided to intersperse the nail stickers with a blue polish, AVON Gel Finish in Royal Vendetta, to pay homage to the show's iconic colours. Love the result! This is super fun!!! I love how the decals showcase the characters without being too over the top! This looks so so great! such cool nails!!!!! would you like to follow each other on GFC?! Let me know and follow me on my blog, I will follow you right back on both GFC and Bloglovin! I'm so glad I got to see these in person! They are adorbs!